Throughout recent years, the idea to make pass interference penalties reviewable has periodically resurfaced. 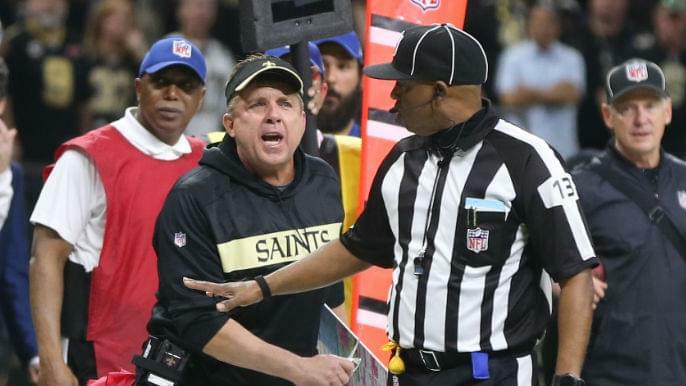 That argument is gaining traction after an egregious no-call robbed the New Orleans Saints of a first down, setting them up favorably for a game-winning score, late in their 26-23 overtime loss to the Los Angeles Rams Sunday. According to ESPN, the NFL plans this offseason to discuss making pass interference penalties reviewable. New Orleans’ Sean Payton and New England’s Bill Belichick — two of the longest tenured, most successful active NFL coaches — are longtime supporters of the rule. Maybe it took Sunday’s catastrophic no-call, which largely contributed to the game’s outcome, for others to jump aboard. If pass interference would have been called, the Saints would have had a first down near the Rams’ goal line with about 1:40 remaining in the game, the score tied. But the Saints settled for a field goal and allowed the Rams to tie the game with an ensuing field goal. In overtime, Saints quarterback Drew Brees threw an interception. The Rams responded with a game-winning field goal to advance to the Super Bowl. In the aftermath of the play, Saints owner Gayle Benson issued a statement declaring, “it is a disservice to our coaches, players, employees and, most importantly, the fans who make our game possible.” Saints fans have rented billboards across the city to communicate their disdain. Saints players, including star wide receiver Michael Thomas, have pointed to Rule 17 Section 2 Article 3, calling for commissioner Roger Goodell to investigate and consider replaying the game. There is a common consensus that “NFL officiating has slipped,” Fox Sports rules expert Mike Pereira told KNBR Monday. One way to prevent situations similar to the one Sunday is to eliminate human error. Other professional leagues have taken advantage of replay systems to ensure the right call is made. In 2014, the MLB implemented instant replay on many of the game’s most controversial plays, from ground-rule doubles, fan interference, and common plays such as sliding into a base. The NBA employs several instant replay rules, whether assessing flagrant fouls, determining if a shot was released before the buzzer, and overturning possession during the final two minutes of the game. The NFL may follow suit with reviewing penalties. Many would argue, if the technology is available, then why not?